The Secular Church is a study of the predicament of the contemporary Christian churches, guided by Bonhoeffer´s ecclesiological insights drawn from the implications of his Chalcedonian Christology. Two other main theological sources are evoked to buttress the author’s argument, Karl Barth and Martin Luther. After a short introduction announcing the denouement of Christianity, the little book unfolds in seven chapters, which may be organized into three blocks. The first, comprising the two first chapters set the stage for the status quaestionis. Christianity is on the verge of extinction for having fallen into the trap of a “Gnosticism” that fuels all forms of dualisms. Public versus private, individual versus communal, contemporary versus traditional are some of symptoms of this Gnosticism that hauls them out of the basic one: the sacred versus the secular spurious divide. Falling prey of this disease, corroded by the Gnostic “cancer” (12) the church cannot fulfill its calling and adjusts itself to culture. Losing the voice of the Gospel it accommodates itself to the organizational chart of a corporation that may be “non-profit,” but definitely it is “non-prophet” (13). Missing the theological significance of the incarnation the meaning of “secular” has been distorted and the presence of the divine is totally missed, for “secular” is the category we employ to speak about presence; secular means “present.” The main purpose of the book is then announced: to reclaim theologically the secular. This is done with the help of the anthropologist Mary Douglas, the sociologist Peter Berger, and the philosopher Charles Taylor. The theological restoration of “secular” shows that “secular church” is not an oxymoron, but a tautological expression of its most authentic existence (31). The second block, chapters, three, four, and five, provides the theological foundation for the whole argument. With the help of Barth´s distinction between form and content, what is called secular is the manifest expression of the God who in God-self remains hidden mystery. But these are not different things, yet different ways of addressing the same reality of God incarnate. Jesus Christ present as church-community is Bonhoeffer’s most concise definition of ecclesiology. This implies that this presence is the one of the crucified. So the Christ that the apostle Paul knows as the one on the cross is equally an ecclesiological truth, as the church is the corporate present body of Christ. The author resorts to Luther’s seven marks (holy possessions) of the church (On the Councils and the Church, 1539) where the seventh of these is precisely the cross. Hence the same epistemological criterion that Paul raises for the knowledge of Christ is equally applicable to the church. Finally the third block, comprising of chapters six and seven, presents Bischoff´s constructive proposal. Following Bonhoeffer´s advice to the church “to speak a new language” (84), Bischoff presents his provoking notion of “reincarnation” to speak about the church as an extension of Christ´s incarnation. The author is aware of the dangers of speaking about a concept that has a long history in Hinduism (but also in some Christian sects). With the same argument against dualism raised in the beginning of the book, the notion of reincarnation, once cleansed from its use along with the soul-body dualism, gains new life to speak about the church-community as a communion of rebirth, which is also the community of Passover that has its prototype in the liberation of God´s people from servitude in Egypt. This process of “re-embodiment” becomes the paradigm for the relationship that the church has to the Kingdom. The difficulty with the creative use of the notion of reincarnation is not so much its association with a doctrine about the migration of the soul, but in the adoption of the prefix re-. It suggests a doubling of the incarnation, another incarnation, which is difficult to reconcile with its once-for-all (ephapax— Heb 10:10) character. Finally, in the spirit of the Reformation the church is not the Kingdom in its coming, it is not even a seed of the Kingdom; it “ushers” the Kingdom. 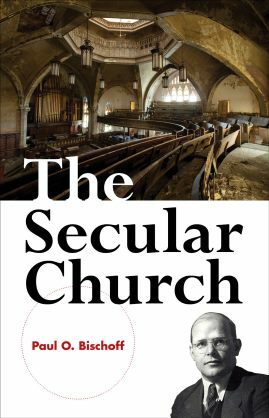 So the book ends with a brief conclusion intriguingly claiming that “for the first time … secular is claimed for theology and church.” Intriguing because it has sustained that this was precisely what Barth and Bonhoeffer had done. Insightful ideas and sharp criticism of the present state of Christendom notwithstanding, the book abounds in superfluous invectives that detract from the very ecclesiological purpose that it passionately pursued. The charge of Gnosticism leveled against an accommodated church is provocative and for the most appropriate, but the virulent criticism leveled at some theologians is aimed not at a supposed Gnosticism. Many of them, like the secularist or the death-of-God theology, may be culpable precisely for holding the opposite position, i.e., for being enamored by a revived form of “Arianism.” Other imprecisions can also be found. The criticism of the so called two kingdoms doctrine as referring to church-state relationship results erroneously from a rather popular North American misreading of Luther. And here Bonhoeffer would be of help for he correctly reads the two kingdoms relation as the one pertaining to the connection between the ultimate and the penultimate. The book would benefit from this insight of the Berliner. For both Luther and Bonhoeffer church and state are different realities (and so is also the household and labor), but all of them belong to the seculum, to Luther´s earthly regime.